Is Delaware-style Sports Betting the Future? Texas is the nation’s second-most-populous state with more than 26 million residents. There are five racetracks. The Texas lottery produced almost $4.2 billion in sales in fiscal 2012. The Kickapoo Traditional Tribe of Texas has two small casinos with video lottery-type slot machines, bingo and poker. For full-fledged casino gaming, however, Texans go east to commercial casinos in Louisiana or north to Indian casinos in Oklahoma, much to the chagrin of pro-gambling forces. Gaming advocates make the same arguments each legislative session: Without gaming, Texas is losing millions of dollars in tax revenues, billions of dollars of investments, thousands of jobs and millions of tourists. 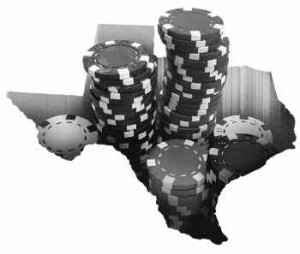 In 2011, Texas lawmakers considered 17 different gaming proposals, including eight Las Vegas-style hotel-casinos and slot machines at Texas racetracks. Few analysts expect 2013’s gaming bills to gain much traction, either. The website Pokerfuse reported New Year’s Day that an Austin lawmaker will introduce a bill that allows the state’s lottery commission to regulate live poker tables operated by Indian tribes or at racetracks and bingo facilities. The measure does not address Internet poker but would ban electronic poker tables. Any gambling bill needs two-thirds support each legislative chamber as well as voter approval in a statewide referendum. Republican Gov. Rick Perry and GOP lawmakers have opposed gambling expansion in the past. John Montford, a former state senator now working a pro-gaming expansion group, told The Associated Press that efforts should be made to keep Texas dollars in Texas. Other than Nevada’s slot machine manufacturing industry, which benefits financially anytime a new gaming market opens, Pinnacle Entertainment has become the casino company with the clearest focus on Texas. Pinnacle owns the Retama Park Racetrack near San Antonio, which figures to capitalize if slot machines are allowed at pari-mutuel wagering facilities. But Pinnacle also has a substantial investment in Lake Charles, La., where the company’s flagship L’Auberge du Lac resorts draws the bulk of its customers from the Houston area, about 144 miles away down Interstate 10. Pinnacle plans to finish construction of a second $500 million hotel-casino in Lake Charles it is acquiring as part of the $869 million buyout of Ameristar Casinos. The deal is expected to be finalized by midyear. Credit Suisse gaming analyst Joel Simkins said Pinnacle will complete the Lake Charles project, but may scale back the development’s scope. Once all in, Pinnacle will have more than $1 billion invested in Lake Charles. Simkins said “it seems clear that Texas will eventually get some type of gaming.” However, even if casinos are approved in 2013, he said it could be 2017 or 2018 before the first cards are dealt. Pinnacle hedged its bet by purchasing the racetrack last April. Penn National Gaming owns two tracks in Texas and is hopes slot machine casinos can be added someday. Simkins said major gaming companies, such as Las Vegas Sands Corp., MGM Resorts International and Wynn Resorts Ltd., will get involved in the Texas gaming legalization effort. Also, Landry’s, which owns the Golden Nugget casino brand, is headquartered in Houston and controlled by Tilman Fertitta, a wealthy Texas businessman. “This is the most concentrated effort we’ve seen in Texas, but the probability of anything passing is low,” Simkins said. Gaming still needs a Hail Mary pass to claim victory. wish our elected officials would let the Texas people vote on this they may be surprised how many of us want to legalize gaming.